When I was a kid, I avoided playing card games. The reason was simple. I couldn't remember all the rules and rather than asking for help, I'd pretend I didn't like the game. So basically, this toy and game review writer does not even know how to play Old Maid or Go Fish. The funny thing is that now, thanks to my kids introducing me to Uno, I LOVE CARD GAMES. First of all, to me, cards are kind of a "naked" game. There aren't any bells, props, figurines, game boards... they're just a bunch of pieces of thick paper cut up into the same shape. It's so simple that in retrospect, I am not surprised that I shied away from card play. You have nothing to hide behind thus "naked." Brain vs. Brain. 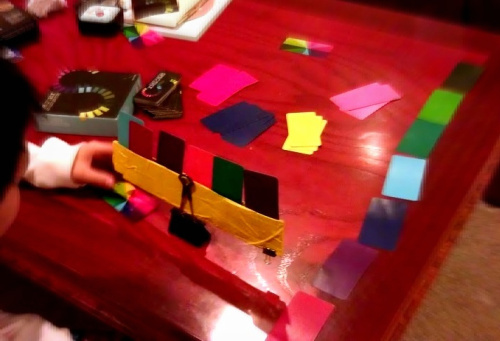 Number 1 can actually hold a bunch of cards but the beginning of a round with Spectrix, players get a bunch of cards so we created this "viewing holder" made out of a paper insert inside the Spectrix box! Just add duct tape and some clips. I still have trouble with learning the rules but luckily Funnybone Toys provides a great explanation video complete with tips and recaps so that you don't feel the need to rewind. I was interested in Spectrix because I had a feeling I could play this with Number 2, who was then just five years old. He did great because he is a sequential learner. 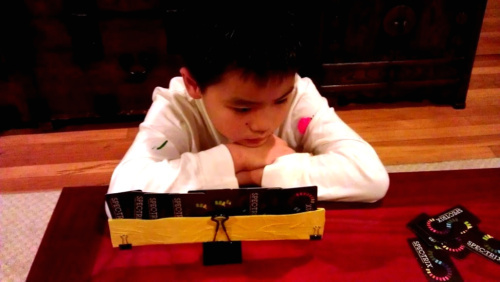 He loves things that go in a sequence like subway lines, steps to draw something, and of course numbers. He loves numbers! 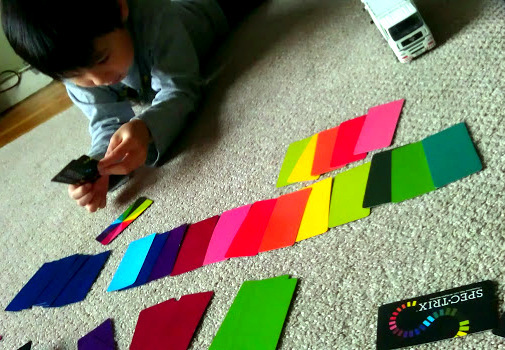 But I know there is more to Spectrix than just sequencing but I couldn't put my finger on how to explain it so I asked Amy Baez, occupational therapist and founder of Playapy for her help. I loved Spectrix before talking to her but after our conversation, I loved it even more. Note how Number 1 who is not in love with reading, likes to make his sequence vertically. I believe some people like to read this way. Create Families The rules of Spectrix are simple. If you know the game Rummy, you'll know that this is similar. My son thinks it's like Uno. Basically, from the cards in your hand, you must either create a sequence of at least three colors in accordance to your Spectrum guide card (12 colors) which you will keep in front of you to help make a correct sequence. You may also create groups of three of cards of the same color. Sounds simple doesn't it? Well it is and it isn't. Should you choose to, you can swipe cards from sequences and same-color "families" that others have made. The point is to get rid of all your cards and those who are behind get stuck with points. Too many points and you're out. Holding your cards with one hand and even moving them around with only your thumb is challenging says Amy. We are working on that! But as far as his ability to sequence and make families... he's got that! This is why I want younger kids playing it. The Spectrix guide card showing the sequences is in a circular fashion but you will likely show your sequences in a linear position. What does that mean? It means you must focus and really look at what you have, look at the guide card, look at the table to see what is out there. You must look for opportunities. You must create them yourself. That is probably THE best part of this game. The 2nd best part is that because you have a guide card and the cards are smaller, you can play this as a family. There is no reading required. You may see that your kid can beat you. Mine did. Oh, what's this? A five-year old trying to add? Beating his mom in this game is motivation enough! It's okay, you don't have to know addition. Tally marks are just as good. Really, who cares if you can make same-color families anyway? Amy Baez does. "Grouping things into categories is a skill that you need," said Amy explaining that in the classroom, children may be creating these groups with words. "It's also used in math a lot." My kid likes picking them up and putting them in order. 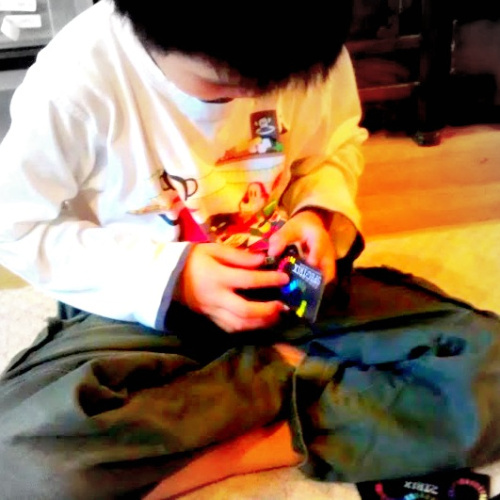 He is going to be a very neat grown-up someday. Even holding the cards in your hands is helpful to kids. It's an improved grasp: she said. "It’s just really developing hand muscle and mastering those skills." Moreover, Amy says that small act of moving your cards around with your thumb is really good exercise for one's hands. Well, you know, in any FunnyBone Toys game, good design is a given. I love the size of these cards. I love the colors used. There are color shades that please both adult and children's eyes and I don't know about you but even though I love my kids, I need a little motivation to play with them. Good design motivates parents too. I think both my kids love to practice shuffling cards. 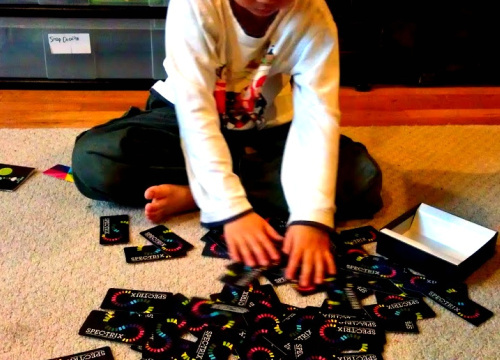 Shown above is the messy way to shuffle which is a lot of fun but the narrower size of Spectrix cards makes practicing one's shuffling technique to be absolutely ideal for young children! I really believe that good design does motivate. My kids love how they can hold these cards more easily. There is something about this game that makes it look so inviting and NOT intimidating. And that is very significant. Like I said, I barely played any cards when I was younger but I think if Spectrix were around back then, I would have probably started my card game admiration a long long LONG time ago. 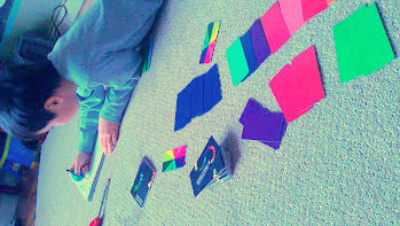 If you are like me and you have shied away from card games all your life, Spectrix is a great way to go. Just like the actual color spectrum, you'll see it appeals to just about EVERYONE! Want to learn how to play? Watch this video. Remember, things like taking cards from the table or creating a "White Light" is something you can do at your own pace. Warning: once your kids learn about getting a "White Light" they will stop at nothing to get it. Time to win your the trio of Funnybone Games ($45 value) that have been disappearing off the shelves of museum stores everywhere! Array, Cubu, and Spectrix are just beautiful. OK, like gin rummy but with colors instead of numbers/suits? I would love to win this, but my husband is colorblind, so I wonder if he'd be able to play with the kids. Amy told me that it is like Rummy. I still don't know how to play.... so embarrassing. I know almost no card games except for Poker. I could go either way on it.